The Buy Now button will take you to the product page. There you can download a free 9 page preview by clicking the ‘Preview’ link at the top right of the cover image. Guitarists that want to build up a foundation in the core aspects of Grade 3-4. This Grade 3-4 ebook is a compilation of almost 9 years of preparation work teaching guitar. I have included guitar lesson sheets that I have prepared and revised many times over the 9 years to be the best they can be for use with my lessons. To create the book I selected only the best sheets from my selection of many more that I created for teaching with. I printed them all out and arranged them into a coherent order. Finally, I created and modified a few more just to make the book run smoothly. I have included only the sheets, rather than add lots of teaching text you might normally find in tuition books. This is partly to limit the amount of pages for those printing, and also to give teachers using the books freedom to put their own take on the lesson sheets. Personally when I get a tuition book for myself, I tend to go straight to the exercises. This will probably make it harder for self taught players, so to anyone getting stuck reading the book I would recommend giving it a go and if you get stuck, research how to read the parts you struggle with. There are plenty of youtube videos out there and help articles that you will find to help. Sometimes youtube videos lack sheet music and written parts, so you should be able to use this book alongside these popular methods of learning, if you are not learning with a teacher. Guitar teachers can use this ebook as a guide for their own teaching. These are the core parts of grade 3-4 but it does not nearly cover every aspect of these levels, so you can dip in and out of this book with your teaching. Let the book provide a fundamental knowledge to the student and loosely give structure and a guide to your teaching and allow yourself to go off on tangents as you and the students move through the book. The key thing here is to tailor your teaching to the students, because they’re all different and will require different paths to explore their own style and learning experience. Each topic in the book is briefly covered. There is much more depth you could go into, and this is encouraged. 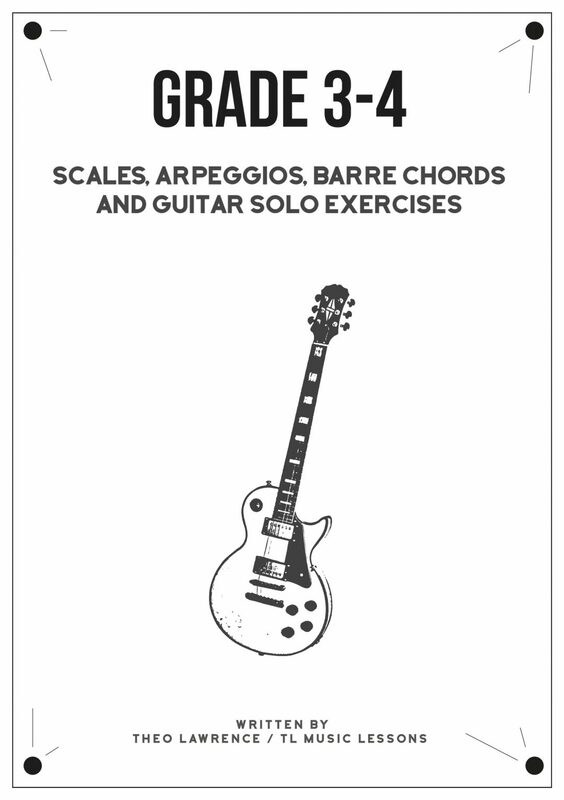 So far, I have already released another ebook that works more on rhythms with barre chords in chord progressions at grade 3-4 level called 10 Group Chord Exercise Sheets – Grades 1-4.